The 2014 holidays are behind us, but at Photo Nanny we think about the holidays throughout the year. Some projects take days and others take months to create. In the case of “life” books, we may be organizing years and years of photos and memorabilia, then scanning what we need, and then creating a special coffee table book to have under the Christmas tree or in the hands of loved ones as an annual commemorative. This year we had the pleasure of helping a client make super special (and easy) gifts to give to many friends and family…personalized acrylic Christmas ornaments made from Christmas cards….actually her friends’ Christmas cards. It was such a cute idea, I knew it would be a big hit and I wanted to share the idea with everyone now that the “surprise” is out. This photo shows some of the ornaments o n our work bench. Each one is unique and the shape of the ornament is selected to best fit the family’s card for that year. We placed red and white striped ribbon at the top of each card ornament, so they were ready to hang up just as soon as their gift was opened. The ornaments were delivered to the recipients in early December, and the response was as we expected. 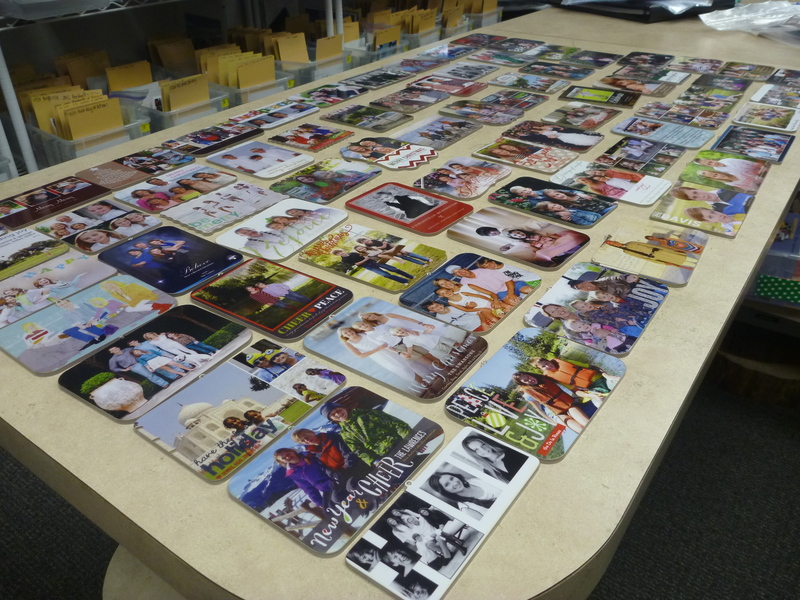 They were truly touched and super excited to now have a neat way to use and enjoy their old Christmas cards. So, we’re still in Christmas mode even in the middle of January creating ornaments from lots of old cards. Imagine a tree covered in all your old memories? Maybe it’s not your Christmas cards, but you want to cover a tree in your family’s history…a photo card for Grandma and Grandpa…maybe each family member as a baby…the possibilities are endless. Gather whatever card you want to turn into an ornament. It can be a single, flat card, two sided or even a fold-over card. Typically these cards all have personal photos on them, but really anything works. If you don’t have a card but want to make an ornament for a friend, a photo will work as the foundation…or have your children draw something in crayon or pencils…magic markers on any kind of paper and we can use that too! Call Photo Nanny to schedule a time to drop off your items. We call you when they’re ready. Deliver to your friends (or even mail since they’re lightweight and can be shipped safely in an envelope) and enjoy the calls and emails from them when they open their favorite little trinket of the season!